Exogenous ketone supplements have become a popular tool in supporting the ketogenic diet. But are they even useful? Are all ketone supplements created equal? And are ketone esters the new super fuel? Allow me to help answer these questions so that you can decide if supplementing with a product that uses raw exogenous ketone esters is the right course for you. As someone who has been doing the keto diet for a number of years, I am always looking for healthy ways to maintain ketosis. Why? Because I find that I function at my best when my ketone levels are elevated. And although I aim to achieve ketosis primarily by adhering to a low carb diet, my attempts sometimes fall short of that goal. Enter the era of exogenous ketones, where you can consume ketones that are created outside of the body rather than depend on only the ketones your body produces. Let me start off with the obvious question and that is what is ketosis and why would we want to be in this state anyway? The definition of ketosis is simply the state of having elevated ketone levels, typically above 0.5 millimoles per liter, or mmol/L. How a person achieves ketosis and how high their ketone readings are will vary from individual to individual. Think of ketosis as a superior fuel source for the body. Our bodies are created to run on either glucose or ketones (sugar or fat). This is a natural process and how civilization survived periods of great food shortage. When our bodies burn fat for fuel we produce three bi-products of fat breakdown, β-hydroxybutyrate (BHB), acetoacetate (ACA) and acetone. These by-products are called ketones. Scientists have known for centuries that the body’s cells are fueled by glucose. However, in the 1950’s scientists also discovered that the body can also be fueled by ketones. When the body does not produce sufficient insulin, glucose begins to accumulate in the bloodstream and does not enter the cells. The cells then burn fat instead of glucose, and ketones form in the blood. It’s why a ketonic diet can help individuals lose weight and still retain muscle mass. Unfortunately, some people confuse ketosis with ketoacidosis. However, ketoacidosis only occurs when the body is not responding to insulin at all, as in a type I diabetic whose sugar-level is out of control. When someone is experiencing ketoacidosis you see ketone levels of 20.0-30.0. This is vastly different from being in a state therapeutic ketosis when ketones levels are only 0.5-0.7. To enter into a state of ketoacidosis your body has to have an excess amount of ketones and your sugar levels will be very high and uncontrolled. In stark contrast, in a state of therapeutic ketosis, your blood sugar levels are low with small amounts of ketones. It is well documented that fasting has been used for centuries for both sacred and nutritional benefits. In fact, as early as the fifth century BC abstaining from food was used as an effective cure for epileptic seizures. We even see it mentioned in the Bible when Jesus cures a boy of seizures and says “This kind (of evil spirit) can come forth by nothing, but prayer and fasting” Mark 9:17-29. The benefits of fast include boosting the immune system, improve cognition, improving insulin sensitivity, and weight loss. With benefits like these, you would wonder why more people wouldn’t make fasting a regular part of their lives. Well, this is because despite it’s many benefits the idea of abstaining from food for long periods of time isn’t quickly embraced. However, what if it was possible to gain the benefits of fasting while still consuming food? This is what a ketogenic diet provides. When committing to a keto diet consistently you can gain many of the benefits of fasting without the need to reduce calories drastically. Experiencing ketosis used to be only possible by reducing carbohydrates drastically in our diet or fasting. However, the ability to do ketone metabolite supplementation makes it now possible to raise ketones exogenously (outside of the body). But why even supplement with exogenous ketones, to begin with? Well, for one it makes the keto diet more sustainable. Who having embarked on a ketogenic diet couldn’t use a little more willpower? Especially in the beginning? The truth is that maintaining a consistent level of ketosis isn’t exactly easy. The purpose of ketone supplements is to simply provide the body with more ketones when you’re not currently in ketosis or when your levels are low. Supplementation makes transitioning into a state of ketosis so much more attainable. This is especially useful for when you consume a higher amount of carbohydrates and you’re kicked out of ketosis. Using exogenous ketones shortens the waiting time to entering ketosis dramatically. Rather than wait days to get back into ketosis you can achieve ketosis in under an hour. Getting into ketosis quickly means you are less likely to abandon the ketogenic diet and therefore reap more of its benefits. I think of exogenous ketones as a sort of willpower in a cup. Being in a state of therapeutic ketosis has quite a number of benefits. The following reasons highlight why we aim to be in ketosis. Better hormone regulation: There are studies that point to how regulating the CCK hormone, which is responsible for stimulating fat and protein digestion inhibits the stomach from emptying, this, in turn, reduces appetite. The CCK hormone is a great regulator of food intake. There are 3 different types of ketone supplements and each has its unique benefit and role. Allow me to break each down for you to help you see what each one brings to the table. These are formed when ketones are bound to a salt. Usually, this means sodium or calcium, potassium or magnesium with the goal to improve absorption in the body. Ketone salts are typically referred to as BHB mineral salts or ketone mineral salts. The majority of ketone supplements out on the market today are ketone salts. Although it is still a new concept to supplement with ketone salts, the rise in the ketogenic diet’s popularity has made it possible for more people to try. Ketone esters refer to raw BHB ketones. It’s a ketone body that isn’t bound to any salt compound. Ketone esters are salt-free this means that instead of the ketone molecule being bound to a mineral, like in ketone salts, the ketone molecule is bound to a different substance via an ester bond. When it comes to exogenous ketones most of the studies point to esters. You can read more in the Journal of Lipid Research and see how supplementation has had no adverse outcomes. Without a doubt, ketone esters have the most potential to elevate ketones quickly and raise blood ketones levels. However, until recently ketone esters weren’t commonly found commercially and were only available for research. This meant that supplementing with esters wasn’t accessible to the average person. What’s more, ketone esters have had two major limitations cost and taste. The cost of the R/D form of BHB is significantly more expensive than the DL-BHB or RS-BHB form the kind that is commonly used in ketone salts. This is because the process of making pure R/D BHB is challenging. Thankfully, researchers and companies have made major strides in bringing the cost down. Making it possible to now purchase a supplement that contains ketone esters. The other limitation with ketone esters is the taste. Most people who have ingested ketone esters have equated the taste to rubbing alcohol or to the moonshine that was created back during the prohibition era. Here again, great strides have been made to improve the taste of ketone esters making them more palatable. Another option that is commonly used in the keto community to raise ketones is the use of medium chain triglyceride (MCT) oils or powder. Although in this case, you are not ingesting actual ketones the MCT’s fatty acids can help boost the levels of ketones that the body produces while doing a ketogenic diet. The main difference is that when supplementing with either ketone salts or ketone esters your body can use the energy they provide immediately. Whereas in ketone oil your body must first break down the fatty acids before it can use it as fuel. What’s more, MCTs do not hold a candle to that of ketone salts or esters when it comes raising ketones. Not to mention that they have a much higher dose of calories. Having understood all the potential benefits exogenous ketones provide what if we could have one product that could combine the benefits of both ketone salts and ketone esters for maximum results? Well, recently TruBrain the leading supplement company when it comes to nootropics, was able to do just that. Their Head of Product, Alyssa Warth, who is a well recognized published expert when it comes to ketone metabolism has led the fight in making ketone esters easily accessible. By creating a ketone supplement that uses both esters and salts TruBrain has been able to address the two limitations that made it impossible for the average person to experience the use of ketone esters. First, the cost has been dramatically reduced making it possible for more people to afford a supplement that has ketone esters and second the flavor is no longer an issue. Their science team was able to engineer an ideal mix of both raw ketone ester plus ketones that are bound to minerals like potassium, calcium, magnesium, and sodium. Doing so has created a supplement that gives you the uptake of ketones so that they can experience quicker while also giving you benefits of being in a state of ketosis for a longer window. Plus by using having the minerals in the product ensures that you are getting the proper electrolytes while supplementing with ketones. TruBrain reached out to us prior to launching TruBrain Ketones to preview their unique mix of raw ketone ester and salts. We were among the first 1000 to test TruBrain’s Ketone supplement. But I’ll admit that I was skeptical if it would be any different from the previous ketone supplements out on the market that I had already tested. Although I am a big proponent of using exogenous ketones, I wondered if it was possible to improve what has already been achieved. The day after our shipment arrived Randy tried his first full serving. Soon afterward he sent me a text saying “esters are no joke” with three fire emojis. To which I responded, “yeah? Wow, it must be powerful if you noticed the effects immediately”. I knew that if he had quickly experienced the uptake of raw BHB ketones it was a great indication that their product was special. The following day it was my turn to try. I started with only half a serving because I tend to feel the benefits of exogenous ketones rather quickly. What I experienced surprised even me, someone who regularly takes exogenous ketones. The first thing I noticed was how quickly I felt the ketones work, even more so than when I supplement with other forms of exogenous ketones. What was most pronounced to me was the laser focus it provided. That morning I was able to check off my to-do list in record time. I had sustainable energy for four whole hours that did not leave me jittery. In case you are wondering they do not add caffeine to their ketones. So the energy you experience is strictly from the ketone ester and ketone salts in their supplement. The other benefit I saw was an increase in appetite suppression. This was an added benefit since it allowed me to intermittent fast easily. What was remarkable for me is this with only half a serving. Randy and I continued to test TruBrain’s Ketones for the remainder of the week with each of us having a full serving. The results were fantastic for us and it’s the reason we can confidently recommend their use. Personally, I find the product to be a little on the sweet side. This, however, is probably because I’ve been doing keto for over 5 years and my taste buds have adjusted. Randy, didn’t seem to think they were too sweet, so again this may just be my experience. It’s my guess that TruBrain needed the extra sweetness in order to mask the strong ketone ester taste, in which case it’s something that is warranted and welcomed. The way I address this is by taking them in 10 oz of liquid instead of the 8 oz that is recommended. If you are wondering how to supplement with this ketone ester/ BHB salt combo, this will depend on how well trained your body is to be in ketosis. If this is a new state for you, we recommend that you start off slowly. I would say, have half a serving for the first couple of days. Then once you’ve worked up to one scoop serving, you can increase the number of servings you can have per day. When it comes to taking TruBrain’s ketones you have a number of options. The only real requirement is that they need to be mixed in a minimum of 8 oz. of water or other beverage of choice. Just don’t add them to any high carb drinks. My go-to preference is adding TruBrain ketones to my hot coffee in the morning. While Randy prefers to drink his ice cold. In the end, it’s a personal choice since either way you get the benefits of the ketones. What’s The Best Time to take TruBrain Ketones? The good news is you can take them at whatever time is best for you depending on your goals. Having a serving in the morning is a great way to wake up your brain while simultaneously boosting your metabolism. If you opt to take TruBrain in a fasted state first it will give you extra focus and mental clarity. Supplementing right before a workout not only gives you extra energy but makes the recovery time much quicker. Another great time to supplement with Trubrain is after consuming a meal that is higher in carbs. Doing so will get you back into using ketones as fuel much faster. Supplementing with exogenous ketones is a great solution for those who want to live this lifestyle but find it hard to stay in ketosis or who simply want to raise their threshold of carb allowance. Many choose to supplement for damage control. Instead of letting a cheat meal turn into a cheat week or month, stop the carb cravings by getting back into a state of ketosis quickly. TruBrain has made it easy for you to try their products by offering our readers a 20% discount. Simply use our code: FITTOSERVE at checkout. Enjoy the benefits of ketosis without the painful discipline required to be in nutritional ketosis. Supplementing with Trubrain ketones is a great solution for those who want to do a keto diet but find it hard to stay in ketosis or who simply want to raise their threshold of carb allowance. Although supplementing with ketones does not automatically equate to weight loss it can be a tool in your weight loss goals. Mainly because exogenous ketones act as a strong appetite suppressor. If weight loss is the goal, combining the use of Trubrain with a diet that is low in carbohydrates will garner the best results. 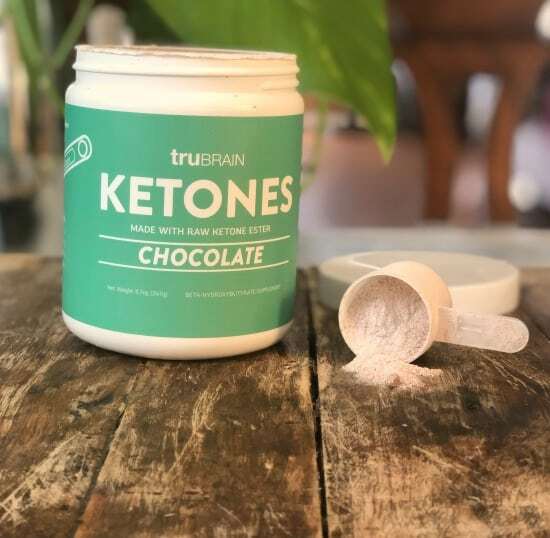 I sure hope you will give TruBrain ketones a try, it may just prove to be the tool that will help you stay true to the ketogenic diet and on the path to better. Do check out our Keto Recipes for easy and delicious options that will further enhance your keto lifestyle.